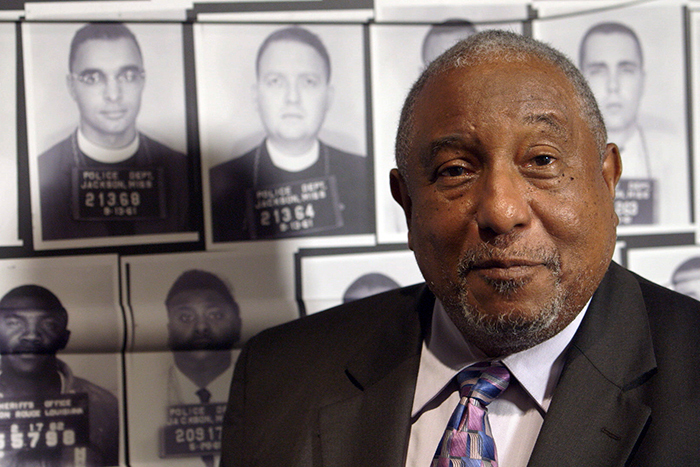 Bernard LaFayette speaks to the camera during a filming for the course at the Center for Civil and Human Rights. 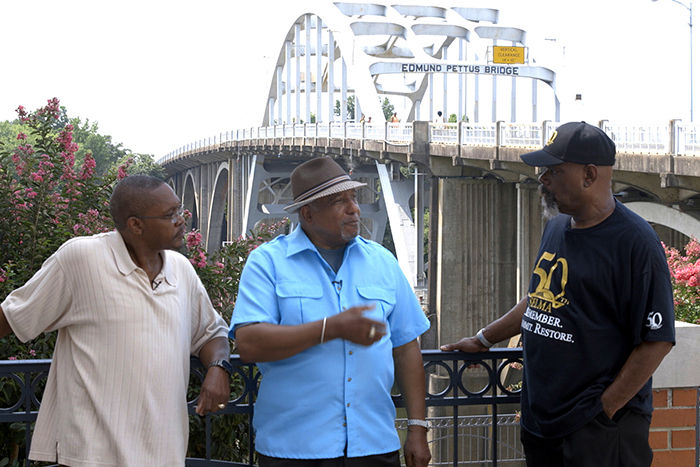 LaFayette (center) talks with two Selma, Alabama, residents at the foot of the Edmund Pettus Bridge. LaFayette tells a story from an exhibit in the National Voting Rights Museum and Institute in Selma that has been recreated to look like the cell in which he was imprisoned. LaFayette (left) talks with fellow civil rights activist Rev. C.T. Vivian at the historic Ebenezer Baptist Church on Auburn Avenue during a filming for the course. 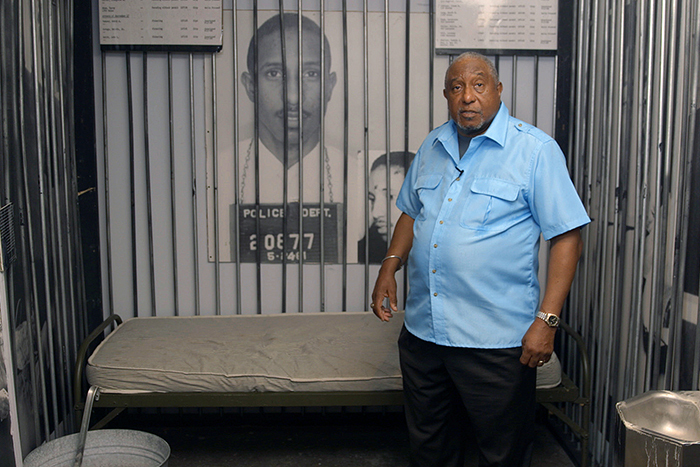 "From Freedom Rides to Ferguson" gives Coursera participants an opportunity to learn from activist Bernard LaFayette Jr. in the context of several locations important to the Civil Rights Movement. All images are screen captures from video by Emory Libraries and Information Technology. An online class debuting today offers the Emory community and the general public a chance to learn about nonviolence directly from activists on the front lines of the Civil Rights Movement. Taught by activist and former Candler School of Theology distinguished scholar-in-residence Bernard LaFayette Jr., "From Freedom Rides to Ferguson: Narratives of Nonviolence in the American Civil Rights Movement" provides an inside look into LaFayette's experiences as a civil rights activist and leader in the 1960s. It also highlights his lifetime mission of institutionalizing and internationalizing the nonviolent principles and strategies promoted by Dr. Martin Luther King Jr. Using the Coursera platform, the MOOC (massive open online course) will be available at no charge to learners worldwide, and enrollment is unlimited. It will be an on-demand course, meaning learners can begin at any time and move through the material at their own pace, and there is no end date. The class is accessible through Emory's page on the Coursera website. "The Coursera platform allows us to share Emory's special resources, such as materials from the Rose Library and the knowledge of Emory's faculty, with people around the world. This course highlights the unique expertise of Dr. Bernard LaFayette," says Lynn Zimmerman, Emory University's senior vice provost of academic affairs. "The stories of the struggle for civil rights and the importance of nonviolent approaches to conflict and protest are as relevant today as they ever have been," she notes. "The opportunity to hear those stories from the individuals who lived and led that struggle is something that we are proud to share with the world." The first half of the course focuses on the 1960s civil rights movement, and the second half examines nonviolent principles and strategies and their applications to modern situations. Several guest speakers in addition to LaFayette are interviewed in course videos, including civil rights activists Andrew Young, C.T. Vivian, Constance Curry and Henry Thomas; and Emory African American Studies associate professor Carol Anderson, who discusses the Charleston church shootings in June 2015 and the subsequent focus on issues surrounding the Confederate battle flag. "Capturing Bernard LaFayette's legacy on camera has been an amazing experience," says Stephanie Parisi, an instructional designer with Teaching & Learning Technologies in the Emory Libraries and Information Technology Services (LITS). "He brought in other civil rights activists to speak with him. To have these individuals sit down together and reflect on the civil rights movement and all that happened, it's a really powerful conversation." 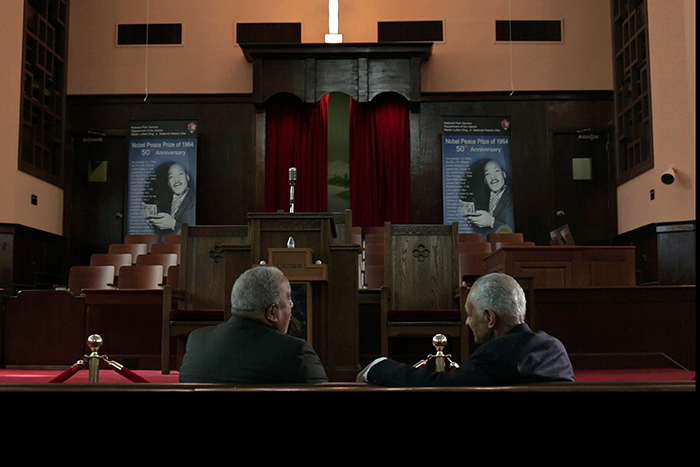 Along with the university as a location backdrop, filming took place at the National Center for Civil and Human Rights, the historic Ebenezer Baptist Church, and the SCLC (Southern Christian Leadership Conference) national office in Atlanta. LaFayette and the crew also filmed in Selma, Alabama, including at the Edmund Pettus Bridge, site of the violent Bloody Sunday conflict when police attacked civil rights marchers on March 7, 1965. "When we filmed in Selma, some of it was done at the Alabama Voting Rights Museum," Parisi says. "We also talked to people who were there on Bloody Sunday, who were 11 years old at the time." "From Freedom Rides to Ferguson" will be a traditional Coursera offering, with five modules containing video segments and conversations, discussion forums and short quizzes. The course is free; however, for a fee, learners can receive a Course Certificate from Coursera upon successful completion. "The experience of watching the videos will be important, and the forums should generate some interesting discussion and ideas," Parisi says. "We expect the material will encourage a lot of personal reflection and critical thinking." Teaching & Learning Technologies' Academic Production and Instructional Technology divisions organized the Coursera course. Parisi says many other Emory resources were instrumental in putting the course together, including the Stuart A. Rose Manuscript, Archives, and Rare Book Library, ECAN (Emory Center for Advancing Nonviolence), BPI (Business Practice Improvement) and Imani L. Lewis, BPI fellow.